WHAT KIND OF DRAGON ARE WE TALKING ABOUT? Rising Dragon: Contemporary Chinese Photography at the San Jose Museum of Art is more of a political performance than an art show. You can start with the advertisement, which features Huang Yan’s “Spring” from his series The Four Seasons. 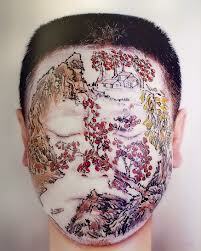 The photograph is of a man’s face covered over or tattooed with what seems like a traditional Chinese painting. The image on the man’s face features the type of scenes we’re used to seeing in that type of painting: beautiful trees, mountains and houses in the forest. One could say that the image on the man’s face is beautiful or tranquil or whatever clichés you might have about Chinese painting. The important and obvious point is that the feeling of the image changes because it is on the man’s face. For me, the painting represents the “face” or reputation of China. But here, because it isn't just the painting, but the image of the painting, it’s clear that it is no more than a fantasy of Chinese life, a Westerner’s notion of the “real” China, or maybe even a Chinese person’s notion of a distant Chinese past. Either way, the emphasis is on the unreal grafted on the real and that theme runs through the entire show. Yan’s photograph seems aimed at Western art, even though what we see on the man’s face is typically Eastern. The use of the body in art is more of a Western tradition and by putting a traditional Chinese image on his model’s face Yan seems to be commenting on a new kind of China, one more vibrant and alive, although the man’s eyes are curiously closed. It’s an interesting photo and begs a whole host of questions about the show and how it’s presented. Yan is famous for this type of work, painting traditional Chinese painting on bodies and then photographing the results. In many ways, his work is the best example of contemporary Chinese art, maintaining tradition while exploiting it at the same time. The question is how does the rest of this show navigate this divide. It’s a tricky question and gets to the heart of the role of the artist in China—not to mention the role of the Chinese artist in the whole of the world. Maybe you should try a different font? 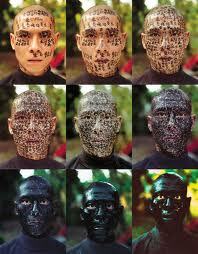 Zhang Huan’s “Family Tree” has nine sections to it, each section is a photograph of the same man with Chinese characters written on his face. As you move from left to right and down the photograph, the man’s face is covered in more and more Chinese text. In the last section, the man’s face has turned into a mass of black ink and the only defining feature of his face are his eyes, staring out aimlessly at us. Huan’s technique is similar to Yan’s photograph; they both use Eastern men’ faces as their canvas and cover them with traditional Chinese elements. Huan’s photo seems to suggest that modern Chinese society has westernized and that Chinese culture is rapidly abandoning its heritage. For me, Huan’s work catches the mixture of history and the future that China must confront or is confronting. There is no way to abandon five thousand years of Chinese history, but that history can be a burden, especially as the world becomes more intertwined, global and technologically advanced. The curators describe the show as exploring the “change in social-identity, the alteration of the natural environment, and the erosion of cultural heritage in an increasingly globalized society.” In this show the “globalized society” obviously means China and the radical changes it is undergoing right now. China is going modern, but what does the modern mean to Chinese art and how does modern Chinese art translate to Western viewers? Take the idea that art should be free and that the artist should be able to freely express his or her feelings and ideas. That’s clearly on the mind of some of these artists, but it isn’t part of the Chinese tradition or culture in the way it would be for an American or European artist. This show, which gives contemporary western audiences a glimpse of the vibrant scene in China, might be overburdened by its task. Not only are all these issues in flux, but also they’re in flux in ways that might not seem readily obvious to the typical American. Nothing is as it seems in China and at least on that level the concerns of the show seem appropriate to photography in the age of Photoshop. Cao Fei’s “Dog Days” from the video Rabid Dogs is clearly about consumerism in China. The photograph is of a couple crawling on a floor and made up to look like dogs. They are both dressed in white-collar business suits. The woman is biting on a Burberry bag and the man wears a Burberry tie around his neck. Fei seems to believe that the Chinese are in the thrall of western consumerism and modernism. Their dogfaces are painted in a manner similar to traditional Chinese opera. Like Huan and Yan, Fei uses the Chinese face as a symbolic canvas to show the tensions between the past and the present. In the photo, the couple stares up and to an unseen master—their eyes clearly reveal their hunger for material things. The desire to be rich and wear luxury brands is a trend in China, and people follow it unconsciously, like the way animals crave food. In Fei’s telling desire takes over everything: it supersedes history, culture, and finally humanity. It’s a chilling photograph and eerily familiar to anyone watching the mainland over the last twenty years. Chen Qiulin’s #3 is a stunning take on the environment and urbanization. In the photograph, a woman in a white dress (purity?) is sitting in front a dressing table surrounded by rubble and calmly putting on her make up. We only see one side of the woman’s face. The other side of her face is reflected in the mirror on the dressing table. She is entirely focused on her make up and shows no interest in the chaos surrounding her. In my opinion, the woman in the photograph represents the China government. Her side face, the side of her face we can see, represents China’s public image; the other side of her face, the one in the mirror, represents the Chinese government and how it seeks to avoid obvious social problems, literally disappearing into the reflection. Quilin’s photograph is a bracing critique of the Chinese government’s careless attitude towards massive societal change. #3 seems to evoke any number of crises over the past thirty years, such as Tiananmen Square and the Sichuan Earthquake. This is a clear example in the show of the interplay between aesthetics and politics. We see this same interchange in next photograph, Tain Taiquan’s “#5,” from his Lost series. The photo depicts a girl in a Red Guard uniform standing in front of a grave. With no face and half her legs in the grave, the girl seems somewhere between the living and the dead. Her face is transparent and there are many names on the tombstone—you can’t miss the symbolism to the millions who died under Mao’s cultural revolution. The cool and creepy tone of the picture represents the careless attitude of the government toward history. It is very interesting to note that Taiquan uses the photo (art) as propaganda in the same way that the government did in the past. It’s as if in the new China the artist has seized control of one small part of the past and is wielding it with equal authority to the government. It’s not that Taiquan or any artist is individually powerful, but their ability to manipulate images, so prevalent in all the work of this show, puts them on more equal footing as both commentators and mythmakers. Liyu + Liubo’s “An Escapee Being Chased Dropped through the Top Floor of Building and Scared Everyone Inside” from The Victim series picks up on the relationship between what happens and how people react to it. In The Victim series, Liyu + Liubo take articles from the news and reinterpret them in satirical ways. In this photo, eleven people sit around a conference table and stare at a man who has apparently fallen through the ceiling, his lower body hanging in the air and his upper body out of our view. Again, the environment and what happens to people in it is foremost on these artists’ minds. The people at the table don’t seem shocked at all that a man has fallen through the ceiling; it makes it seem as if this has just become the everyday reality of Chinese life. This is a clear reference to the “Tofu-dreg,” a disaster that revealed how unsafe many Chinese buildings were. The 2008 Wenchuan Earthquake is another perfect example of the type of social unrest that can happen when the government just puts on a false front and isn’t really interested in the safety and the welfare of the people. Weng Fen‘s “Taibei 2009” from Future Plans series encapsulates most of the issues running through this show. 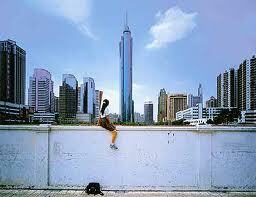 In “Taibei 2009” a girl stands in the middle of the picture and in the background there is the Taipei 101 building. The girl only shows the right side of her face; she looks away without any emotion. This series and this photo take on many controversial issues. First, the title “Taibei” is very close to the name of the city Taipei, and I think that is purposeful. Mainland China’s relationship to other sovereign Chinese nations is a burning issue for the whole region. The question is on what side of the issue the artist is on: Chinese unification or political separation. The young girl looks as if she has no real identity and by having Taipei depicted in the background would seem to suggest that she yearns for Chinese political unification. Or, maybe she’s looking towards Mainland China with fear over what it could mean to her homeland, a free and independent Taiwan. It’s hard to tell. Second, the artist chooses a girl and not a boy. By using a girl the political issues and the social issues fuse together. Political unification has much deeper social ramifications for women than for men. From a Chinese perspective and especially anyone living in Taiwan, it’s a disturbing and ambiguous photo. 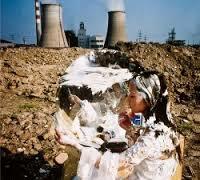 Rising Dragon: Contemporary Chinese Photography takes on the issue of propaganda and political grievances head on. What we see is an entire group of artists trying to come to terms with a rapidly changing world, one where eastern and western values, both politically and aesthetically, are fighting it out. The only point that is clear is that there are no clear positions. And even though “Rising Dragon” is a kind of stupid title for the show, it does catch something about what’s happening in China right now—for the people, artists and the government. I might phrase it slightly different: which Dragon will rise and which Dragon will fall? It’s one of the most important questions facing the world in the early 21st century.